Sell Tickets on Your Own Website with Your Own Logo & Branding! Setup Your Own Ticket Selling Website in 3 Simple Steps! Collect Money Directly in Your Account, Several Days Before the Event! Let Buyers Pick Their Seat On an Interactive Seating Chart! Don't Pay High Charges to Sell Tickets! This video quickly reviews Ticketor.com and signs up for a new ticketing site using Ticketor. At the end of the video, a ticketing website is created and you will be ready to customize it. Hello everybody. In this series of videos that we call it ‘Sign Up to Launch in 30 Minutes,’ we are going to walk you through signing up for a ticketing website on Ticketor, designing your website, setting it up, integrating your payment processing method (PayPal or merchant account), and then setting up a venue and event and start selling tickets. So basically the goal of this video is a quick overview and to give you a good understanding of what Ticketor can do for you and how easy it is to set it up. At the end of these videos, you will have a full featured ticketing website and are all set up to start selling your tickets. So if you are here watching this video you probably have read about Ticketor on our website. You know why you have chosen Ticketor over other 3rd party ticketing sites. As you may know Ticketor is a white-label ticketing solution that allows you to have a full feature ticketing website in, as fast as 30 minutes or less and start selling tickets on your own website. And why is Ticketor exceptionally different and what are the benefits you get from having your own website as opposed to selling on a third-party website? · The first thing is that you will sell on your own domain, with your own logo, with your own branding and design and so instead of promoting other ticketing websites you are going to promote your own website. · The most important benefit that you get is that you get paid directly before the event and as the tickets sell. If you sell tickets on a third-part website they will collect the money on your behalf and send you a check AFTER the event which means that you have to pay all the event costs including renting the venue and equipment, hiring people, etc. out of your pocket and then you will get paid after the event. But using Ticketor you get paid as the tickets are selling which means that you don't have to invest as much money into the events. You can do it with less investment. · The other benefit is that our fees are the lowest in the industry. You are eliminating all third-party fees. Ticketor charges only a small percentage of your ticket sales. So it gives you lots of room to make extra money or probably return this money to your buyers. You can increase your ticket price as the fees are lower, or you can add the average service charge that is usually charged by 3rd party websites and keep the extra. That’s what we call ‘pay negative fees. Most 3rd party ticketing systems charge 10 to 25% in service charges and the general public is already used to paying such high fees. Considering Ticketor’s low fees, if you keep charging the same rate, then you will earn an extra 5 to 20%. Basically “paying negative fees” means that not only you don’t pay fees for selling your tickets, but also you can make money out of it. · Ticketor also offers powerful and unique features that you cannot find on many ticketing websites. Features like “interactive seating charts”; Our seating chart designer is compatible with almost any seating chart, amphitheater style, round-table (dinner-style), or general admissions. So basically we support any kind of seating chart or event. Ticketor also supports automatic self-service returns (if allowed by your returns policy), printing e-tickets with secured barcode, ticket validation using your smart phone, marketing features, social media and Facebook integration and a lot of other features that you can check them out on Ticketor.com. · Our pricing is described on the pricing page. There is also a “cost calculator” on this page that you can use to calculate your cost based on your ticket face price. You can get a good understanding of the cost involved and how to set your service fees accordingly to transfer all the cost to the buyer or to make extra revenue. · There is a Samples and Testimonials page. You can find some sample working sites based on Ticketor, some seating charts and what our customers say about us. o “Gate Control and E-Ticket Validation” which explains how to validate printed tickets and distinguish duplicate and invalid ones. o “Box-office staff, retail stores and phone agents” that explain how your staff, retail stores or phone agents can use Ticketor. · Finally there is a signup button right here at top right corner.. So let’s start with signing up: The signup will take less than 30 seconds. All you have to do is provide some basic information. I am going to start with my email address (slow down so I can enter my information), choose a strong password as it is your administrative password and everybody with this password will get access to all your ticketing information. So I filled the administrator or my personal information, now I have to fill out the website information. My business name, I call it Ticketor Demo. Then I have two options here regarding the address of my website. Even though you can change this information later on, it is good to know what each one means and select the one we need. I should choose the first option if I want to have the ticketing website on my domain or sub-domain. Let’s say I have a domain named www.TicketorDemo.com and I want to build a ticketing website on this domain, then I have to enter it here. www.TicketorDemo.com; (typing the domain name) . Maybe I already have a website on TicketorDemo.com which I want to keep and I want to add a ticketing section to this website. In this case I can use a sub-domain for ticketing section. So I can put tickets.ticketordemo.com in this box (typing the domain name). Please note that option one requires premium plan. The second option reads: I want to use Ticketor.com as my domain with a folder name. I should choose the second option if I am using the Standard plan or I want to build my ticketing website on www.Ticketor.com/ some name that I choose. For this demo, I am going to choose the second option and I will choose TicketorDemo as my address. So the address of my website will be www.Ticketor.com/TicketorDemo (typing the domain name). If you have a domain and want to use it with the Standard plan, you still have the option to forward your domain on this address. Now I have to choose my plan. There are 3 plans to choose from: Free trial, standard and premium. You can compare the features in each plan in the “Pricing” page. The most popular plan is the Premium plan. It comes with all the great features that Ticketor has to offer. It includes all the ticketing features as well as promoting features that help you promote your events using social networks, mailing lists, etc. It also has the features to become more than just a ticketing website and possibly your official website. It supports different page types including photos page, videos page, blog, html pages and a store online where you can sell DVDs, T-Shirts, etc. Moreover, the website can be on your own domain or sub-domain. Premium plan comes with a $29.95 monthly fee. If you are selling tickets to more than one or two events per year, then this plan is highly recommended as the promotional features included in this feature can easily pay for its monthly fee. The other plan is the Standard plan. There is no monthly fee involved in this plan. If you are on a budget or have occasional events, maybe a couple events per year, you can choose the Standard Plan. This is also a great plan, offering all the features for selling tickets including seating charts, e-tickets with barcode, e-ticket validation with smart-phone and all you need to sell your tickets. If you are still not sure if Ticketor is right for you and want to evaluate it, you can choose the Free Trial plan. No credit card is required for this plan. You can build your site, evaluate all the features and upgrade to other plans when you feel comfortable. Please note that there is no long term contract involved in any of the plans and you can cancel anytime you want to. In this demo I am going to choose the free trial. As you can see there is no credit card required. I can just click on ‘I Agree & Finish.’ (hold for the page to load) And I get a Congratulations message that my website is now created. Here is a link to my website, Ticketor.com/ticketordemo and when I click on it it takes me directly to my website. I have also received a welcome email with a link to my website. So let’s click on the link and visit our new website. In this video, we are going to visit your newly created ticketing website powered by Ticketor and get familiarized with different sections. So here we are. We just signed up for a ticketing website on Ticketor.com and this is our new website. As you can see the website has some default pages and some default design and it is on the address we chose: Ticketor.com/ticketordemo. So the first thing to remember is that from now on, you should always go to this address to sign in and manage your site and events. You shouldn't go to Ticketor.com as your website is on the address you chose, in this case Ticketor.com/ticketordemo. If you have chosen to have the website on your own domain, you should still use this temporary address until the domain setup is completed and the website is transferred to your domain. So basically this is how the website will look to everybody. Administrators, agents, organizers, regular user and even signed-out visitors will see the same view with minor differences. If you are not logged in at all or logged in as a non-administrator user, you will not see some of the menus and buttons here including this Administrative menu. Here at the top, we see “Welcome Kevin” which is an indication that I am logged in as Kevin who is an administrator. Later on when you come back, you may not be logged in, and as a result not see some of the options available to logged-in users and administrators. So let’s go over different sections of your website. · There is a notification box here that I am going to minimize for now. · Here is my logo or a logo placeholder. The system created a temporary logo that I should replace with my own as part of designing my site. · There are some pages here. There is a “tickets” page that lists all the upcoming events and is currently my home page, there is a “past events page”, about us page, and a contact us page. You can add more pages or delete the ones that you don't like. · You can update the content of any page so if you browse to the about us page [pause] there is some content by default. You can click on edit content button and edit the text. · There is a “chat with us” box here so if you have any questions feel free to put it here and ask us. During the business hours we will get back to you immediately. During the nonbusiness hours we will get your message and will respond to you as soon as possible, usually the next day. · Here is the menu. As you can see there is an Administrative Menu here and this menu shows up here only when I’m signed in as an administrator. If I log out [pause], the website looks very similar but the Administrative Menu goes away and when I click on sign in and put in the email and password I used to sign up with[pause],I get a welcome message and the Administrative Menu comes back. · Administrative Menu is where you set up your site, events, venues, tickets, promotion codes, get reports and manage your site. · Let’s start with this Support section. In the Help/FAQ page you can find step-by-step, easy-to-follow instructions for everything you may need to do. We keep it short and to the point so you can just follow it step-by-step and accomplish your goal. It has instruction for integrating your payment processor, [pause],PayPal [pause] , pointing your domain or subdomain[pause], integrate Facebook [pause], Google AdSense [pause], Google Analytics[pause], Creating an Event[pause], Add or Removing tickets[pause]. I highly recommend that you follow these instructions to build your site, set your events up, and handle ticket delivery and validation. · Ok, lets go over the Administrative menu. The first option up here is the Users Menu where you can find all your users and manage them, you can send out mailing lists or newsletters, you can get some analytic reports on your campaigns and mailing lists like how many people opened your emails, or how many people actually clicked on it. · In the Event section you can create events, create venues, create promotion codes or coupons. You can also get check your event statement get a real-time update on the status of your event and tickets. · Next is the reports. There is a Sales reports, Sold Tickets, Sold Products, Credit Card, Event Statement, and more. · Then there is the “Delivery Reports”. This Print Tickets option allows you to print e-tickets, for will call or mail deliveries. You can get Admission Lists here, Unsold Tickets, or you can go to the Gate Control on your Mobile or tablet to scan tickets and validate them. So let’s go back to this Notification Box. It only appears for administrators and it lists new features or the steps you need to take to improve your site. When you first start, the notification box lists a series of steps that you should take to complete your site. Some steps like “Adding a payment method” is required for the site to work while some others like facebook integration is optional. The first step here is to Design your Site. The second step is to Add a Payment Method. The third step Add an Event. The next Integrate with Facebook. Integrate with Google AdSense. As an example, lets look at the “Integrating with Facebook” step. Here it shows where you should go to make the integrations. It is under Administrative, Settings, Site Settings[pause], and click on Facebook tab; or you can click directly here to go to that page. The other thing to notice here is this question mark or help icon. So basically there is a step-by-step instruction for integrating with Facebook and I can click this question mark [pause]and it opens in a new tab pointing to the Facebook integration instruction. I should follow these steps to create my Facebook page, Facebook app, a tab on my Facebook page for listing my events and starting the sales process right from facebook, Facebook log-in and facebook events. Everything I need about Facebook is here. It is very important to follow these instructions to quickly and smoothly achieve your goal. I am going to follow the steps in the notification box in the next videos and start with Designing my Site. Ticketor is a white-label ticketing solution, meaning that Ticketor enables you to sell tickets on your own domain with your own logo, branding and design. In this video we are going to design and brand the newly created ticketing site. We are going to upload our logo, choose a full design and theme, change the colors and designs and choose background images. We are also going to upload our logo to be printed on e-tickets and set the outgoing email headers and email footers. You don't need any professional experiences to use the Ticketor designer tool to design your site and tickets. Ok, in this section we are going to design our website. The website comes with a nice default design but you can change it to meet your needs and to match it with your logo and content. As the first step in the notification area instructs me, I should go to Administrative menu, Settings, Design the site, or click directly here. I am going to Administrative, Settings, Design the Site [pause]. A design panel shows up on the page where I can design my site, upload my logo, upload a background image, page header and more. To begin with, it gives me the option to pick a full designer-made design and probably modify it afterward or I can start from the scratch and build a full design. If you are not a professional designer or even if you are, I recommend that you first check out the full design options and try to use one as a starting point. So lets take a quick look at the available functionality here. In the first tab, I get the option to pick a full design from this gallery. I can also pick a theme from this gallery. Themes control my sites overall color. Then there are some layout options. In the next accordion panel, I can upload my logo, next I can upload a version of my logo that will be printed on e-tickets. Next I can upload an image as my email header. All the outgoing emails from your site including the welcome emails, purchase confirmations, password reset, contact us emails and news-letters , will have this email header at the top. It can be your logo or something like your site header. Next accordion is the email footer. Similarly, it will show out at the bottom of all outgoing email and could be a signature. Both email headers and email footers are optional. The next tab is called sections. It allows you to customize, change colors or gradients and upload images for different sections of the site including page background, page header, module background, module header. The next tab is called custom css. It is a kind of coding language that gives professional designers more power and flexibility to design the site. You don’t need to use it at all and if by any chance you want to use it, you should minimize the use of custom css and test your site carefully to make sure your code is not breaking site functionality on different pages. Now that we had a quick overview of the design panel, lets have an overview of the site and each section. Here is my logo. As I hover over it a pencil button appears over here that I can use to upload my logo. I can resize the logo using the left-bottom corner or I can drag it around anywhere in my page header area. Here above this dotted line is my page header. Basically I can have an image in this page header, which I can upload using this pencil button over here. I can change the height of this page header by dragging this dotted bottom edge. And here is my top navigation. The top nav has direct link to my most important pages. I can change the items in this top nav later on. During the design, I can drag it around. I can resize the container using the left and bottom edges. For example, if I make it too small the items will wrap into two lines. I can change the height of the module headers by dragging the bottom edge [pause]. This is the module body. I can set the background color or image for the module header and the module body separately. To do so, in the design panel you can go to the sections tab, and either in the module header or module body sections. Same as the page background, I can choose a solid color, a gradient, or pick an image from the gallery or upload one from my computer. The other section on a page is the page header. As the name indicates, it exists at the top of all the pages. Before, we learned how to change the height of the page header. Using the designer panel, sections, page header, we can change the color or set an image for the header. Ok, now that we learned about the designer tool, lets actually design our site. I am going to use one of the designer-made full designs that match my logo color. [5 sec pause]. I chose the design and I hit “apply” [pause]. This designer design basically sets all the settings for me, including the theme, background colors and images, sizes and everything. Next I am going to use the same logo as my e-tickets logo. E-tickets logo are the logo that will be printed on every e-ticket [3 sec pause]. Then there is the email header and email footer section. Any email that goes out from your site, will have this images as header and footer. Even though they are both optional, having at least one makes your emails look more professional. I am going to upload my logo as the email header [pause].You can be more creative and design something nice for your email header and footer. I will leave the email footer empty. I am happy with my design and I am going to keep this for the rest of this demo however, you may want to continue with customizing the design by changing the background picture, header picture or colors. Some clients change their background picture or header picture frequently to match the theme of their upcoming event. Anyway Ticketor makes it easy to design your site and to change it anytime you want. One of the greatest advantages of Ticketor is that it allows you to collect the money directly using your payment processing methods. It means that you get the money directly, as sales happen and long BEFORE the event and can use the collected sales money to pay for some of the event cost. In this video we go over different payment processing methods, and how to get one and how to integrate your payment processor into Ticketor to directly accept credit cards on your website and collect the money directly in your bank account. This video talks about Braintree, Authorize.net and PayPal integration. Ok, now that we have completed our design, let’s continue to the next step. I am going to open this notification box and the next step is “Add a payment method”. As you can see here is a help link that points to the step-by-step instruction, a link PayPal integration and a link for payment processor integration. So what is a merchant account (payment processor)? A merchant account is an account that allows you to charge credit cards directly on your website. There are different merchant account providers and different types of gateways. Ticketor supports different types of gateways. If you already have a merchant account in the United States, Canada or some EU countries, it is most likely compatible with Authorize.net gateway. So you can simply contact your merchant account and ask them for the authorize.net gateway. If you need a new merchant account, one of the fastest and easiest options is BrainTreePayments.com which allows you to sign up online and most probably get a merchant account immediately or in a couple days at no monthly fee and no setup fee. They also support many countries and currencies. Please note that this information is accurate as of the recording date of this video and may change at any time. Please check out the merchant account section for all the supported options. And what is PayPal? PayPal is a very common and well-known payment method. While PayPal offers advanced and pro accounts that work like a merchant account, the standard PayPal is good only as a secondary payment method. It is not recommended to be used as primary or only payment method because PayPal requires that the user get redirected to PayPal.com to make the payment. It also requires the user to have a PayPal account. Due to the extra complexity for the user, we highly recommend that you add a merchant account as a primary payment method so the buyer can pay directly on your site using their credit card. Fortunately, merchant accounts are very easy to obtain now a days and you can get one in as soon as a few minutes. If getting a merchant account is not an option in your country or for a specific reason, then you can use the standard PayPal as your only method of payment. So lets start integrating with PayPal and merchant account. I am going to open the help in a new tab to be able to follow the instructions and I need to go to Administrative menu, Settings, and Site Settings, and click on PayPal or Merchant Account. I am going to minimize this notification box for now[short pause]. And go to Administrative, Settings, Site Settings[pause]. Ok, let’s look at what Site Settings has to offer. We start with my website name. If I want to change my website name I can change it right here. I can choose a secondary name, optional. I can change my business name and put in my corporation, Inc. or something. I can choose the default currency for my website. We support different currencies here. And what is next? Let’s go to the PayPal section[short pause]. Here is where I can integrate with PayPal. As you can see down here there is no logo for any payment method. As we integrate with PayPal or Merchant Account logos for paypal or visa-master card will show up here. I can integrate with Merchant Account in this tab [short pause], Integrate with Facebook here[short pause], Google Analytics here [short pause], and Google AdSense here[pause]. So let’s start with PayPal All I need to do is to fill out the following fields. API Username! What is API Username? The answer is right here in the help section. I can either go to the next tab, which was the instruction for PayPal integration or I can click on this help button, which takes me directly to the help section for PayPal integration. It gives me a step-by-step instruction to log in to my PayPal account and where in my PayPal account this information exists. All you have to do is just follow the instruction, grab this information from your PayPal, copy them and paste them here. I have this information already so I am going to copy and paste them. It is very important to copy and paste this information very carefully. An extra or missing letter will make it not to work and you end up getting an error message on the check out page. Please note that these values are case sensitive and you cannot replace lower and upper case letters. So I put in my API Username, API Password, and API Signature [pause]. As soon as I hit save[pause] I can see a PayPal logo appears here in my site footer and my users can now check out and purchase tickets using PayPal however It’s not tested yet and if there is a typo in any of these fields, the Paypal check out will fail. That is why after I add tickets later on, I have to make a test purchase with PayPal to make sure it goes through. The next tab is for integrating a Merchant Account to accept credit card directly on your website We support different and most popular credit card getaways. Here is a list of supported payment methods and as you select each, you get a eshort description and how to get such account. In this demo I am going to use my Authorize.Net account. I select authorize.net and it is asking me to provide API Login ID and Transaction Key. I click on this help button and it tells me exactly how I get these values from Authorize.Net. I have this values right here. So I am going to copy and paste my API Login ID [short pause] and I am going to copy and paste my Transaction Key [short pause]. Then it asks me about the name that appears on buyer statements. I am going to put in Ticketor Demo [short pause]. If you are not sure about the name that appears on the statement, you can ask your merchant account provider. My merchant account accepts American Express, and Discover, so I checked both boxes. And I hit save[pause]. I get a confirmation message “Settings updates successfully” and as you can see here Visa, MasterCard, American Express and Discover logos show up on my website footer. Again this is not tested yet. We have to test it later on, after we add tickets to make sure that this is working properly. This video teaches you how to create your first general admission event. As part of the video we create a venue, then we create a new event, set the sales start date and time, select delivery methods (e-tickets or print at home tickets, will-call or venue pick up tickets, mail), upload flyer and thumbnail for the event, design the e-ticket and finally add tickets for sales. We add different price levels and price variations. In the past videos we signed up for a Ticketor website, we designed it and we integrated our payment processing method. So our website is now essentially ready. We can create an event and start selling tickets immediately. Obviously there are much more things you can do with your website for example you can add pages here, you can edit the content, you can integrate with Facebook, Google and more; but they are all optional and you can skip them for now and add them whenever you have time. This is the event information page. As you can see there is an information tab, delivery tab, returns policy, pictures, tickets, and promote. Let’s start with the information tab. We should fill out the “event name”. There is an optional secondary name, that goes on the second line and you can use if your event name is too long. We have to select the organizer. The organizer is the person who owns the event. He will get an email on every sale and he will have access to the sales reports for the event. If there is somebody beside you, the administrator, who needs to have access to this data, you need to introduce them as organizer, and choose them as the event organizer. By default, you are the only organizer in the system. Next is the event date and time. I am going to pick a date, Saturday. And then the time, I am going to put 9:00 pm. Sale Start Date is the exact date and time when you want to start the ticket sales. Before this time, the event will be listed on your upcoming events page with an “Information” button but no Tickets button. At the Sales Start Date, the “Information” button changes to “Tickets” button and sales start. Unless you want to hold the ticket sales up to a certain time, you can choose today or any date in the past and start the sales immediately. Next field is the Sale End Date and time. Similarly, at this time the ticket sales will end and the Tickets button, changes back to the “Information” button. Please note that the Sale End Date can actually be AFTER the Event date as you may want to continue your sales even after the event starts. In this example the event starts at 9:00 pm and ends at 12:00AM. We are going to leave the sales open until 11 which is 2 hours after the start of the event. The gate control system will be able to validate tickets as they sell and there is absolutely no issue with validating the tickets that are sold later. The next field is the venue. If you have already created the venue or the venue is already in the system you should be able to find it by typing a few letters. So let’s say I want to use Nokia Theatre. As I type a few letters, it shows up. I can simply select this. If my venue doesn’t exist in the system, I can just click on “Create a New Venue” button. I have to enter the venue’s name, so I am going to put in Demo Venue. Seating Chart Name is optional; I am not going to use it now. The region, I am going to put Los Angeles, CA and I should fill the address. Make sure to put in the address accurately as it will show up on the website, tickets and users can get a map and direction base on it. 123 Main St, Santa Monica, CA [slowly]. Choose the venues country. Here is a list of all countries. I select United States. Specify the time zone. All the times including the start and end dates are based on the venues time zone. My time zone is Pacific (United States and Canada); and I hit Save. [pause] Record updated successfully. My venue is now created and here I see an “Open seating chart designer” button. If I am planning to have an assigned seat event then I have to use this seating chart designer tool to design my seating chart. I am not going to design a seating chart in this video as there is another video on this subject. For the purpose of this video, I am creating a general admission event and I don’t need a seating chart. Ok, lets close this venue information pop up. My new “Demo Venue” is now in the venue field. The currency for this event is US dollars. We support many currencies. You may choose Euro, Canadian Dollar, Australian Dollar, Great Britain Pound, etc . You can have categories here, let’s say party; it’s an optional field. There are 2 options for the Seating type and it is very important to set it correctly. It could be general admission or in other terms first-come-first-serve, or it could be assigned seats. A general admission event is the type of event that the seats don’t get assigned during the ticket purchase and as a result, there is no seat number on the tickets. All standing events and first-come-first-seat events fall into this category. However, there may be different section and different price levels. The other type of the events is called “Assigned seat”. In an assigned seat event, seat numbers are assigned during the ticket purchase and tickets have seat numbers printed on them. In an amphitheater style venue, the seat position is usually identified by 3 parameters: Section, row number and seat number. In a round-table venue the seat location is identified by table name and seat number. I am going to select “General admission”. There is an “Active” checkbox here. If it is checked, the events will be active and visible to users on the upcoming events page. The next field is a big description box. It is a rich text editor and I can add any details about the event here. I can also add videos, and additional pictures. User will see all these information on the event information page. I am going to put a short note here: “21 year old and over”. I can also put something like doors open at 8:00 pm. Using this toolbar, I can change the font, size and style of the text. Lets make it bigger to stand out, make it red, bold, italic, and set the alignment to center. As you can see in the toolbar, there is a button for embedding an image and another button for embedding a video. If you are a professional web designer and want to edit the source HTML, you can click on “Edit Source” and update the html. The next tab is the delivery methods. There are basically 3 different delivery methods. The most popular delivery method is e-tickets. If you offer this method and user selects it, they can easily print their e-tickets at home and get admitted using the printed tickets. It is the best option for the users as they receive their tickets immediately and they don't have to wait in a line to pick it up. It is the best option for you because it requires no effort on your side. Another delivery method is called “Will-Call” which means the buyer purchases the tickets and pays for it online and they will pick them up later on. Usually the pick-up location is a booth at the venue, but it could also be some retail stores or other designated locations. People who don’t have access to a printer will choose this option. The 3rd delivery method is mail. The buyer purchases the ticket and pays the amount online and you print out the tickets and mail them to the buyer. Unlike the first 2 methods, there is some cost involved in the mail delivery. By default the system comes with the first 2 delivery methods. You can add as many delivery methods as you need and you can associate shipping charges with delivery methods that the user will pay as part of their purchase. You can click on this “Add delivery method” button and define new delivery methods. For this specific event I am going to stick with the default methods: Will-Call and Print e-Tickets and I am going to check both to offer both options. The next tab is the returns policy. By default, the returns policy is to not accept returns and that all sales are final. If you want to accept returns you can click on return accepted then you can specify until what time you accept returns. The default value is 48 hours before the event. You can also specify a deduction percentage. The deduction percentage will be deducted from the return amount. For example I can say I want to deduct 10% if the tickets are returned for store credit. Store credit is credited to the user balance and the user can use it toward further purchases. If the user or you want to exchange the tickets for another set of tickets, you can simply return the tickets for the store credit or account balance and use the credit to buy another set of tickets. [short pause] And I am going to charge 15% if they want to get a refund to their credit card or PayPal account. The system will automatically enforce my returns policy and if return is allowed, the user can simply log in to their account and return their tickets. The next tab is the pictures. Pictures are optional but it’s highly recommended that you upload at least one image or flyer. We support Flyers, Thumbnail, and Picture of the Venue; which can be an image of the seating plan. I am going to click on browse,[pause] choose this as my Flyer and I am going to check this check box that reads “use this as Thumbnail”. So it will resize it and use it as both my Flyer and Thumbnail. I am going to hit save. [pause] Event created successfully, great! So if I brows to the “tickets” or upcoming events page in a new tab, I should see the event there [pause]. The event is here. Here is the date, here is the thumbnail, here is the address and direction, and here is the Buy Tickets button. If I click on the image, I can get more information including the text we entered at the description box: 21 and Over. Also, it indicates what time the ticket sales will end and it clearly describes my returns policy. I can click on the tickets button to purchase tickets [pause] but as you see there are no tickets for this event here as we haven’t added any tickets yet. The message box reads: “Sorry! There are no tickets available for this event” and since we are logged in as the Administrator it gives me the option to add tickets. The next tab in the event info page is the tickets tab. There is a couple options here like if you want to show the remaining number of tickets to the user or if you want to show the service charge. This is how the ticket editing page looks for general admission events. Please note that it looks totally different for assigned seat events. Basically in a general admission event, I can have different sections, and I can have different price levels for each section. Let’s see what each section actually mean. I click on Add section. Sections could be different areas in your venue where each area requires a different ticket type. You may have a main floor and balcony and different types of tickets probably at different prices for each section. You may have standing tickets and seated tickets. You can have general admission tickets or VIP tickets. So for this demo, let’s have a section for main floor[pause]. [read slowly]You can put in a short description here for example: Standing Tickets. Then you have to set the ticket price for this section. The ticket price consist of 3 prices. First is the ticket face price, which is the value printed on the ticket. Then there is the service charge which is the dollar amount or percentage of the face price that you want to charge as service fees. And last is the buy price. Buy price only makes sense if you are a reseller and buy the tickets at a discounted rate for resell. Buy price could be the dollar value or a percentage of the face price. Next, I will add tickets for this section. For example the capacity of the main floor is 100 people so I am going to add 100 tickets for this section. Here is an add or delete option that I can use to add or delete tickets. I select “Add”, put in 100 in the box and click on the Add Tickets button. [pause]100 tickets added successfully. The system makes sure not to sell over 100 tickets for this section, however out of this 100, some will be sold at general price and some at student price. My venue has also a balcony section so I am going to add a new section, [read slowly]balcony, No description here, the balcony tickets are 20 dollars and again 10% service charge. So I am going to add this section. [pause] The balcony can accommodate 50 people so I am going to add 50 tickets for the balcony. [pause] You can also specify different price levels for the balcony. I am going to add a VIP price level to my main floor. [read slowly]I select the main floor, click on add price level. The name is VIP, description is “Includes unlimited drinks” and the price is 70 dollars with 10% service charge and hit save. Down here is a table that shows the number of tickets in each section. We can check it out to verify our settings. The main floor has 100 tickets. They are all available, 0 expired, 0 sold. Balcony has 50 tickets, 0 expired, 0 sold, and the total is 150 tickets. Everything looks good. Ok, lets go to the user side and see how it looks to the user and how they can choose their section and price level. Let’s go to the tickets page [pause]. And I can click on the tickets button[pause]; Here is the find tickets page exactly as what your users see. The user can see that there is a main floor for 40 dollars, VIP, early bird, students, and balcony for 20 dollars. I am going to add two main floor tickets [pause] and I am going to add one main floor student ticket [pause]. Here at the top is my shopping cart with all 3 tickets. It is not showing me the service charge at this point as we set that in the event settings. My total so far is 80 + 30, $110. I can click on proceed to check out here and go to the checkout or payment page. Or if I am on any other pages I can hover over my shopping cart up here and I can click on checkout. [pause] On the checkout page, I should first choose a delivery method. The delivery methods we set in the event setup is showing here. I can choose either the will call or e-ticket option. Lets choose e-tickets. As you can see the price is $110. There is a non-refundable service charge of 10% or 11 dollars and the total is $121. If you offer a promotion code and the buyer has one, they can enter it here and hit apply to get the discount. Next they can specify their payment method. As we have integrated both a merchant account and PayPal, both options are available to the user here. If they choose credit card, they can fill out the billing and card information and finalize the sales here [short pause]. If they choose PayPal, they get this PayPal button which takes them to PayPal to make the payment and finalize the sales. 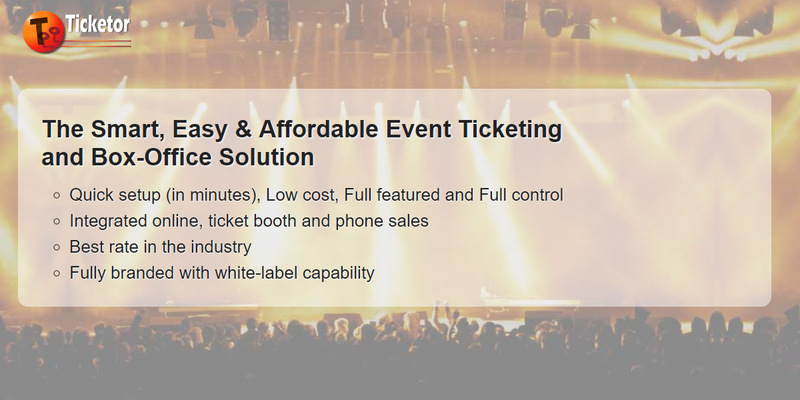 One of the advanced features of Ticketor is the ability to sell tickets to virtually any event including assigned seat events. Ticketor provides a powerful seating chart designer tool that allows you to create seating chart for virtually any venue (amphitheater style, round-table dinner style, arena, night club or any combination). The buyer will be able to pick their seat on the interactive seating chart. In this video, we learn how to create seating chart for the venue, how to set the event up and add tickets at different price levels and variation to the event. In the previous video we created a general admission event and it is already active and ready to sell. It was very easy and fast to create a general admission event. In this video I am going to introduce the assigned seated events. We are going to use a tool called “seating chart designer” that helps us design a seating chart for our venue. So let’s start with some background information. To create an assigned seat event, we should first create a venue. Then we have to design the seating chart for the venue. Then we create an assigned seat event that uses this venue and last we add tickets to the event. If the venue or the seating chart exist, I can re-use the existing venue and skip the first 2 step. For this example I am going to re-use the venue we created in the previous video, ‘Demo Venue’, and I am going to add a seating chart to it. Let’s go to the events menu [short-pause] and venues[pause]. I am going to search for the venue we created in the previous vide: “Demo venue” [pause]. I am going to edit the venue [pause]and here is all the information. Here is the button to “open the seating chart designer”. I am going to click on this button [pause]. And it opens up the seating chart designer in a new tab. Remember that the seating chart is attached to a venue and not to an event. So when we design a seating chart we do not have the price categories in mind. We just are creating a seating chart for the venue. Using this approach, we can re-use the seating chart for all the events in this venue. Obviously pricing structure may vary from event to event. This is why, we don’t consider pricing at this step. · Click anywhere in this box to add a section, then use the mouse to drag them around or resize them or change their setting using the gear icon. · Please note that for amphi-theatre style seating charts, the stage should always be at the bottom of the screen and the first row you add in each section, is the closest row to the stage. Ok let’s click here in the box. Basically this area is the area where we design our seating chart. It is scrollable to the right and scrollable to the bottom so you won’t run out of space. You probably have your venues seating chart on a piece of paper. So first rotate the seating chart so the the stage is at the bottom. Then we start from the section at the most top-left and we create that section. Then we move to the section to the right and then we go to the next row of the sections. Remember that this area is only scrollable from right and bottom and if you don’t start from the top-left most section, you may run out of space or end-up having a lot of space and will need to move all your sections. There are 4 different types of objects that you can add at any location on this seating chart. · First object is called “section”. Section is what you usually see in an amphi-theatre style venue. There are rows of seats and each seat has a number; this is what we call a section. · Second object is called “general admissions section”. If there are areas in your venue that are not assigned seated, you should use general admission section for those areas. For example you may have a standing section in a theater. Another example, you may want to sell the orchestra level of a theater as assigned seat and balcony as general admission. General admission section, allows you to have events that are partially assigned seat and partially general admission. · The third type of object you can add to a seating chart is a table. Tables are usually used for dinner-style round-table events or as tables in a night club. · The last type of object that you can add to a seating chart is called a shape. Shapes are used to indicate the location of the stage, bar, dance floor or the playing field. In a lot of venues, the right section has seat number descending and the center and right sections accessioning. So for this section, I am assuming that my seats are descending from left to right so I choose 5, 4, 3, 2, 1. Now I am going to add the row and as you can see the row appears in the section. To make sure the ordering and arrangement of the seat are exactly the same as the seating chart I hover over this row, so that the seat number appear and I verify that they are exactly as I intented to. So it is A20, 19, 18, 17, up to A1. Now that the first row is correct, I can continue to row B and the rest of rows. It is much faster now since we have already set the ordering. I just change the row number to B, and if the number of seats in row B is different than row A, I adjust the seat numbers. Lets say row B has one more seat, so I change the 20 to 21and add the row. I am going to add row c with 22 seats and row d with 23 seats.[pause]. Ok, for this example let’s assume that all sections have only 4 rows. If I hover over the rows to see the seats as you can see they are aligned left. This is how we set it when we first created the section. If I need to change it, I can click on the gear button, click on edit section, and this is the information I entered originally. I can edit any of the settings here. For example I can change the alignment to right-align and it will change the alignment of the seats in the section. I created the balcony right section and the seats are aligned to the right now. Now I am going to add another section here. I set the sales priority to 3 as this section is more desirable comparing to the previous section as it is in the center of the balcony. Name is balcony Center[pause]. The alignment is centered. Since this is a center section, left and right seats are as good so the sale preference doesn't actually matter for a center section. I am going to put left to right and add the section,[pause] Click on add row. In this section I have 4 rows, all the seats ordered ascending from left to right and starting from 101. Row name: A, the seats are numbered 101 to 110[pause]. Add row [pause] hover over and verify on the seating chart [pause],add row B, 101 to 112 [pause]. Row C, 101 to 113[pause]. And row D, 101 to 114[pause]. Ok. So, we added section 2. And now I am going to add another section for balcony left. I notice that my balcony left is very similar to the balcony right. The same number of rows and seats. The only difference is the name of the section, the alignment of the seats and the sales preference. So instead of creating a new section and adding all the rows I can save time by duplicating my balcony-right section. I click on this gear button, click on duplicate section and I can get aduplicate section for balcony Right. I drag it over here, click on the gear and edit section, change the name to balcony Left. Change the alignment to left align and change the sell preference to left to right. So we just added 3 sections. For the sake of this demo I am going to add some tables here. Let’s assume that in the front row we have some tables. I am going to click here. Click on add table, set the sale preference to 2 as it is closer to the stage comparing to the sections we added, set the name to Table A. There are 12 seats on this table so I am putting them from seat 1 to seat 12. I choose the shape of the table, round, square, rectangle, or corner table. I am going to select round, and add my table. I can resize the table using this corner [pause]. I need 3 more tables the same as this one. So I am going to duplicate this table and drag it over here. Again, duplicate and drag, [pause], duplicate and drag. I am also going to add one big rectangular table with 40 seats, table E, seats 1 to 40. [pause] I am going to resize it to make it a little bigger. I am going to use drag and drop to arrange them perfectly. So this is Table A. This duplicate is automatically named A2 so I have to edit each duplicate table to change the name to B. This is Table C[pause]. And this is table D [pause]. So we just designed the table area. Let’s say we have also a standing area. I am adding a general admission section, [pause] .The sales priority is probably 5, these are not the best available tickets as they are standing. I name it Standing. The maximum capacity of this standing area is 200 people and it will be rounded corner, square [pause]. I am going to make it bigger to cover all this front area. Now let’s add the stage. So I am going to click on add stage, call it a stage. I want to use a rectangle for that and click save [pause]. I can resize and adjust the location. [pause] I also want to show the bar area so I add shape,[pause] call it bar, and move it here. So we can drag and drop and resize the objects on the seating chart. We can also rotate any object. I should hover over the gear button, click on the gear button, and click on rotate shape. And now I can move this slider to rotate my bar to make it vertical. Or maybe these sections are not all horizontal so I can click on this gear, click on rotate section, rotate this section a little bit [pause], click on this one, rotate section and rotate it a little bit[pause]. In this demo for the purpose of training, we added all types of possible sections to our seating chart. Now you should be able to create any type of possible seating chart, an amphitheater, an arena, a dinner-style venue or a night club. That is it for the seating chart designer. All my changes where getting saved as I was making them and we are now ready to create the event. Please note that as soon as you assign tickets to the seats in the seating chart, the seating chart will not be editable any more. So make sure that your seating chart is complete and error-free before continuing to the next step. To create a new event, I go to Administrative > Events > Events [pause], I click on add event here[pause]. I am going to call it Assigned Seated Demo Event. Secondary name is optional. I am going to leave it empty, I am going to use the default organizer, myself. The event date, lets put it for next month [pause]. The Start time 9:00PM. I want to start the sale immediately so I leave the sales start date to today. We want to keep selling tickets up to 11:00 pm on the event date, which is actually 2 hour after the start of the event[pause]. For the venue, I already have created the venue so I just type in a few letters of the venue name [pause] and it shows up. Currency is US dollar, categories is optional. Seating type is very important. I change it to assigned seat and check the active check box. I can add more information about the event as well as additional photos and videos in the description box. [read slowly] Delivery method, I am going to offer both will-call and print e-ticket. Returns policy let’s have no returns policy for this event. Pictures, I am going to browse and upload my flyer [pause]. And I hit save [pause]. So event created successfully. I can go to the home page in a new tab to see my event [pause]. Yes, it is created right here. I click on the ticket button [pause], as I expect it is showing the seating chart but there are no tickets available as we haven’t added any yet. So I have to go back to my edit event tab, go to the tickets tab, and click on add/update tickets [pause], and start adding tickets to my seating chart. To add tickets, I have to select the section first. I see all my sections and tables in this drop down. Balcony right, balcony centered, balcony left, table A, B, C, D, E and the standing section. I choose balcony right first and I can see all the rows in this section in the next 2 dropdowns [pause]. I am going to have tickets in the first 2 rows at $40 and the next rows at $30. So I choose row A to row B. I have to create a new price-section for my 40 dollar tickets. I click on “Add section” button. You are probably familiar with this dialog from the previous video. I can give it a name like “Vip” or “Front” or “$40”, set the buy price, face price, and the service charge, very similar to what we did for the general admission event. As you know buy price is for the re-sellers. Basically if you buy the tickets to re-sell it online then you can specify how much you are going to pay for the tickets. It can be a certain dollar amount or it can be like 90% off the face price. The face price would be 40 dollars. I am going to add 15% in service charge. My total cost for selling tickets including the Ticketor cost and the payment processing cost is probably around 5% to 6%. So by setting the service charge to 15%, not only I am not paying any cost for ticketing, I am also making an additional 9% of my ticketing. I add this price-section. If I have price variations for my $40 tickets like senior price, student price or early bird price I can click on add ticket variation and add those variations. Lets add a student price variation at $35 which means $5 discount for students. So the ticket name is student, description is “Student ID required at the entrance” [pause], face price is $35 and again 15% charges. Then I am going to click on add tickets [pause] and it shows me the number of tickets added, and I can also see on the seating chart that the first 2 row in my balcony-right has now tickets available. Now I want to add row C and D at a different price. So I select Row C to Row D here. I can see the $40 price-level that I created before here but I need to create a new price level. So I click on add section again, fill out the fields [pause], set the face price to $30, and again 15% service charge and “Add Section” . And I click on add tickets. [pause] Tickets added, I can see them on the seating chart and as you can see each price level is displayed in a different color. The guide here explains what each color actually mean, what price variations are available for each price level and any description for the price. I am going to do add tickets for balcony center and balcony left. [read slowly] Balcony Center, row A to B. I am going to choose price level $40. The price already exists so I don't have to create a new price section, I just select it from the list. Add tickets[pause]. Balcony Center again, row C to D. 30 dollars, Add tickets[pause]. Balcony Left, row A to B, 40 dollars, add tickets [pause]. And Balcony Left, row C to D. 30 dollars, add tickets [pause]. So this is how my seating chart looks. Now I can add tickets to each table and also to the standing section exactly in the same way. Let’s add tickets for a couple of tables. Table A from seat 1 to 12 I am going to specify a new price. I call the section VIP, “Includes dinner and unlimited drink [pause], face price 200 and the service charge of 15, add section. Add tickets [pause], 12 tickets added. And as you can see now this table is colored and the guide displays my VIP price [pause]. Let's add some standing seats as well. I am going to the standing section. Let's add just 20 tickets for this section. I am going to add a new price level, call it standing, set the face price to 20 dollars and the service charge of 15%. Add section. Add tickets [pause]. The section is now colored which means that there are seats available here. And there is a colored coded price in the guide [pause]. So we are all set here. The event is now ready to sell. Let’s see how it looks to the user and what the user experience is. Lets go to the home page by clicking on the tickets here. [pause] Event Demo Assigned Seated, I am going to click on the tickets button [pause]. The seating chart is displayed here. I have 2 options to buy a ticket. I can either ask the system to give me the best available seat in a price level or I can pick my seats from the seating chart. For the first approach, I select that I need 2 tickets and I need the price to be 40 dollars and when I click on “Find best available seat” the system finds 2 seats for me and it adds them to my shopping cart. They are 40 dollars each, and here are my seat numbers. I can also see the seats on the seating chart. The system finds me the best available seats based on the “Sales Priority” and “Sales preference” we set while designing the seating chart. If I don't like these seats I can simply delete them from my shopping cart [pause] and pick the seats from the seating chart. So lets say if I want to buy these 2 seats, the ones in the center, I click on the row, I slect that I need 2 seats in this row, and I choose that I need the center seats. [pause] As you can see I got these 2 seats in my shopping cart. I also want to add some VIP tickets from this table [pause]. 2 tickets from this table [pause] added to my cart and maybe I need some standing tickets also so I am going to click on standing section. I need 3 standing tickets [pause]. My shopping cart displays all the tickets I added. I can click on “Continue shopping” to go back to the list of all events and add tickets for other events or I can proceed to checkout. To make the payment and finalize the sales[pause]. I choose my delivery method: print e-ticket or will call. Here is my total face price, here is my total service charge, which is actually the 15% of the total face price and my total. If I have a promotion code or coupon I can apply it here. I can pay by my Visa/MasterCard or I can pay with PayPal, both options are available here. To create by credit card, I have to just fill out the form and click on buy items. As people buy tickets, those seats will automatically become unavailable on this seating chart and will be shown in gray. The system automatically controls the inventory for you. Sign up to launch in 30 min.